Polymer-based components and sealing systems. 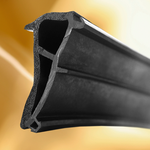 We are a leading manufacturer of extruded profiles for transport, construction and industry. Production facilities in Sweden, Germany, USA, Poland and Lithuania. Great emphasis is put on R & D. We continually explore opportunities to use new materials and solutions that can improve the customers’ manufacturing processes or achieve higher performance. Working closely together with our customers is more like a partnership to us. Trelleborg is a world leader in engineered polymer solutions that seal, damp and protect critical applications in demanding environments. The group has more than a century of experience in innovative thinking and polymer engineering expertise and offers products and solutions from space to the seabed. Experience in innovative thinking and polymer engineering expertise. We offer polymer-based components and sealing systems.